My two days in Xi’an passed too quickly, as I knew I would miss my lovely room at the Grand Hyatt and the company of the Xi’an team. But now it was on to Shanghai for the next leg of the trip. 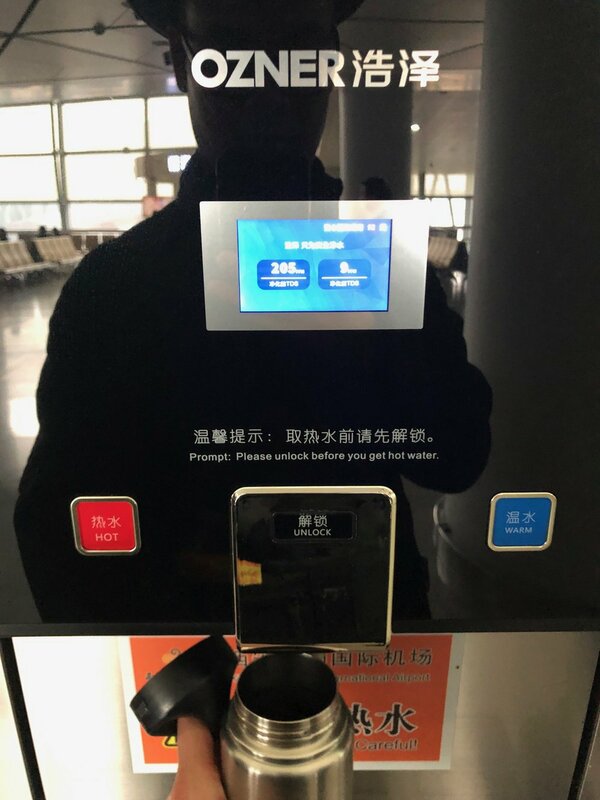 At Xi’an airport, I noticed that there were water dispensers that were in heavy use. They even had plenty of paper cups and conveniently located trash bins for those who didn’t bring their own bottle. It did look like most travelers had their own water bottles - this is one area where I think Chinese custom is more environmentally friendly than elsewhere, especially in Spain where bottled water is still considered normal and acceptable. One very curious aspect was that the two options for water temperature were: Warm and Hot! I now prefer warm water, so I was actually quite happy that these were the two options. However, “warm” turned out to be more like room-temperature water, so I did have to press the “unlock” button and add some of the boiling water to my bottle. The older gentleman next to me also filling up his water bottle bitterly complained that “warm” wasn’t warm at all, and looked for a place to throw away his tepid water! Boarding my China Eastern flight was by bus, and we pulled up to a Shanghai Airlines Boeing 737-800. Shanghai Airlines is a wholly-owned subsidiary of China Eastern, so this wasn’t entirely surprising. But usually I would expect that the ticket would have an “operated by…” disclosure, and that the flight attendants would say “China Eastern operated by Shanghai Airlines,” but there was none of this. It operated as if it were a China Eastern flight. 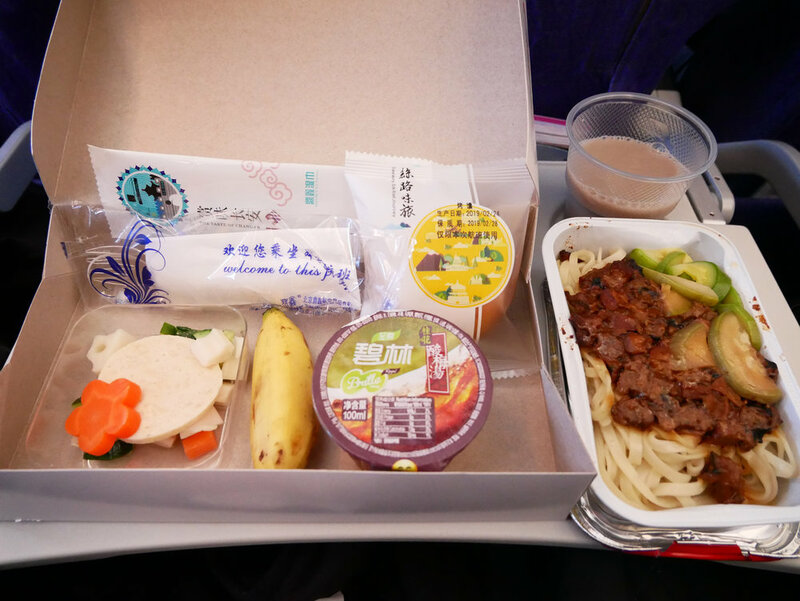 Given that my 2 hour 15 minute flight on Air China from Beijing to Xi’an, with a 12:15pm departure, served just a warm shaobing sandwich with meat, I was curious what this flight would bring. The journey from Xi’an to Shanghai Hongqiao airport was also scheduled for 2 hours 15 minutes, with an 11am departure. When the flight attendants rolled the two trolleys down the aisle, I learned that this would be a lunch flight after all! We were given a choice of beef with rice or pork with noodles, and it was served perched atop a cardboard box decorated for Chinese New Year. I chose the pork with noodles, because I figured that noodles would be appropriate for a flight departing Xi’an. Like on Lufthansa, were quite limp. The pork sauce and zucchini were okay. On the drinks cart, I spied a carton of something I'd never seen before: black soybean and black rice drink 黑豆黑米. It sounded like something right up my alley (since I love all nuts and seeds and cereals and legumes), so I was excited to order it. Delicious! Milky but not too creamy, and just a bit sweet. I got seconds of it. Later in Shanghai, I looked in the convenience stores for it, but couldn't find it. Since I didn’t check in until the airport, I was relegated to a middle seat next to a broad-shouldered man and a not-too-petite woman. So lunch was a good way to pass the time, I got to try out some new food (and beverage! ), and the meal was quite filling to boot, letting me hit the ground running in Shanghai.